Petique Pet Stroller to the Rescue! My dog Penny has trouble walking due to an ACL tear in her right back leg. Unfortunately, it’s inoperable as she also suffers from a heart condition and can’t undergo surgery. As a result, when we walk any distance, I need to carry her. But if I have other things to carry, it can become awkward and tiresome. That’s why I’m delighted with my new Petique pet stroller. Like a baby stroller, when not in use it folds down easily with just a turn of the handle so it’s compact and can conveniently be stored in a closet or car. 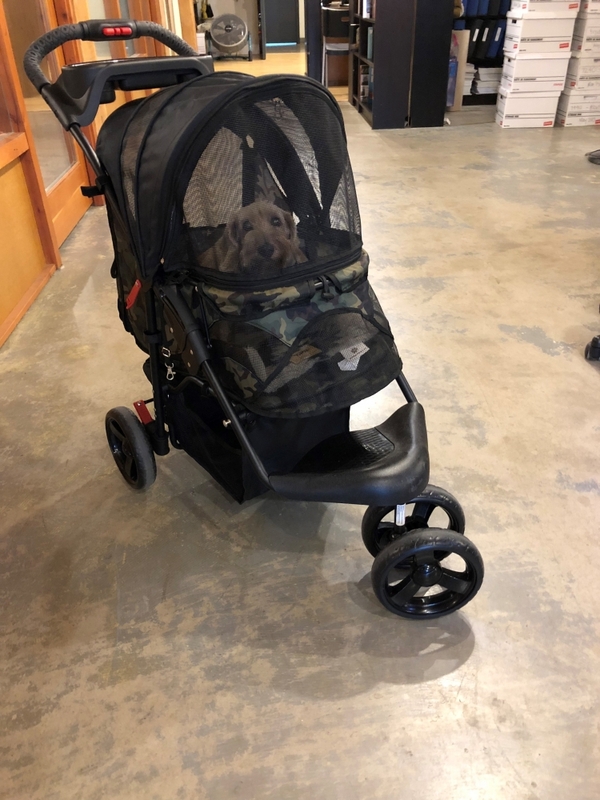 The Petique stroller features large EVA tires and double front wheels for easy maneuvering, a cup holder tray that can fit up to two cups and a rain cover to protect your pup from the cold. 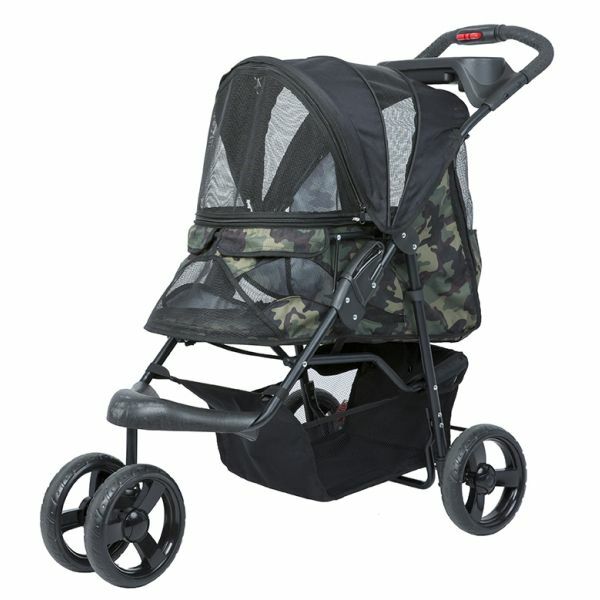 It supports pets up to 35 lbs and comes in four colours: black camo, blue, pink or green camo. And when you’re out with your furry traveler, just pull the meshed hood down and it can zip closed so you can discreetly hop on transit or pop into a store for some shopping with your pooch incognito. There’s even a storage area underneath so you can stash shopping bags, your purse and such. Check out more reviews for Petique here! Looking for unique gifts to give to your favourite dog this upcoming holiday season? My Modern Dog, Hank Jr. recommends Messy Mutt’s new Travel Water Bottle & Bowl for quenching his thirst on-the-go! This award winning water bottle is super easy to use and perfect for all of your walks, hikes and road trips, no matter the season. 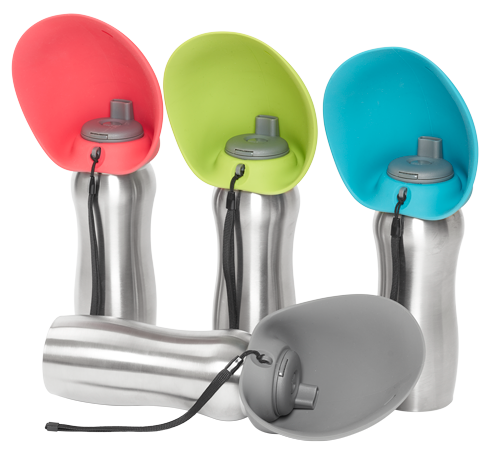 The removable silicone bowl comes in four different colours: red, blue, green and grey and is attached to the bottled and folds down for easy portability. 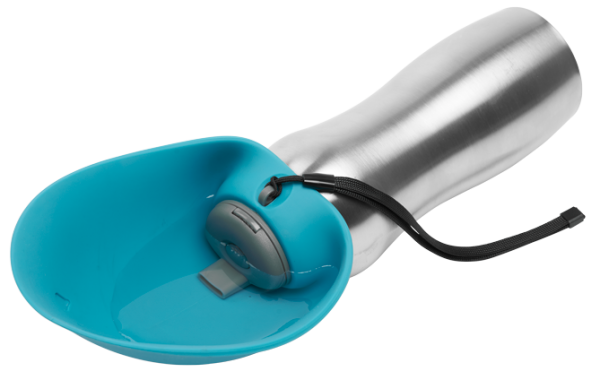 With just a press of the quick release button, the bowl can be opened and filled with water. Any unused water can be tipped back into the bottle, so you can be certain that not one drop of water goes to waste and the bowl folds back up against the stainless steel bottle for easy and convenient portability. We know that your favorite pooch deserves nothing but the best! However, it can be hard to find quality items that speak to your dog’s unique personality. We here at Modern Dog love Madison & Maude’s line of designer dog collars! They are a family business who says their mission is to offer sleek and stylish designs for your pet that are timeless. Their line of dog collars is designed to suit any need for any pooch! These collars will please any dog, no matter if they want to keep it subtle or stand out in a crowd. Madison & Maude use Horween Chromexcel Leather that is sourced in the US. It is a soft and durable leather that is strong and comfortable for your dog to wear. In most of the designs, Swarovski crystals and genuine gemstones are used to add a little glamour to the collar. They are also available in a variety of different colors for you to choose from. Each collar is handmade in the US and Madison & Maude will customize the collar to fit your dog’s neck size. Even more, Madison & Maude offers a personalized custom service, so you can customize the design yourself. They also offer custom engraved ID tags that can be personalized with your dog’s details. The tags are jewelry grade and hand-polished! Do you or your pup want to make a statement? Then check out Sleepy Holow’s line of quality dog collars! 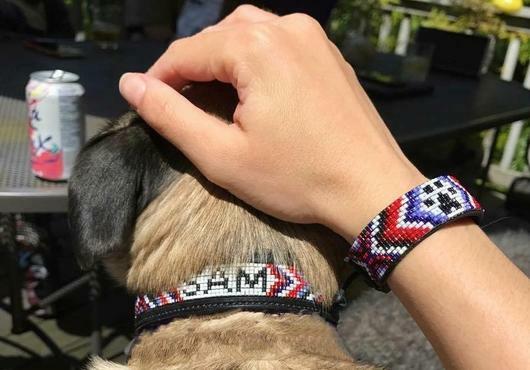 They offer a variety of collars to choose from such as leather, beaded, blinged, nylon and paracord! Each collar is handcrafted by hand with the highest quality materials. Sleepy Holow’s owner Kim Holowatiuk creates every item herself in her workshop at home in Alberta, Canada! Want to spoil yourself as well? Check out Sleepy Holow’s exclusive Furs ‘N Hers line! You can purchase matching collars and bracelets for you and your best dog friend! Any of the collar styles offered by Sleepy Holow can be made into a Furs ‘N Hers set. Both the collar and the bracelet are custom fitted to ensure that you have the proper size for both you and your dog! With the start of sweater weather season, it’s important to keep our beloved dogs warm as the days get colder. But it can be difficult finding sweaters that will fit your dog properly. Connie Kogler, started Canine Cardigans after struggling to find sweaters that fit her beloved miniature Dachshunds. Kogler re-uses second-hand sweaters or coats made for people and turns them into unique dog sweaters. Each sweater is unique and hand-crafted in Kogler's workroom at home. She only re-uses sweaters made from natural fabrics such as wool and cashmere! Even better, Canine Cardigans sells sweaters for dogs that weigh anywhere between 1 to 100 lbs, so you'll find any sweater for any size dog!